You'd think that cocktails go hand-in-hand with dessert, but I think I've been burned by too many underwhelming ones over the last few years. Most of the drinks I have at restaurants often try too hard, and err on the side of being either too sweet or too bitter. There are a few exceptions to the rule, but these days, I often find myself reaching for the beer and wine menu instead. I just want something light and refreshing, ya know? But every so often, a cocktail comes along that slaps me in the face and shakes me out of my beer and wine rut. Something so tasty and perfectly balanced that each sip takes me away from whatever crowded restaurant to somewhere else completely. 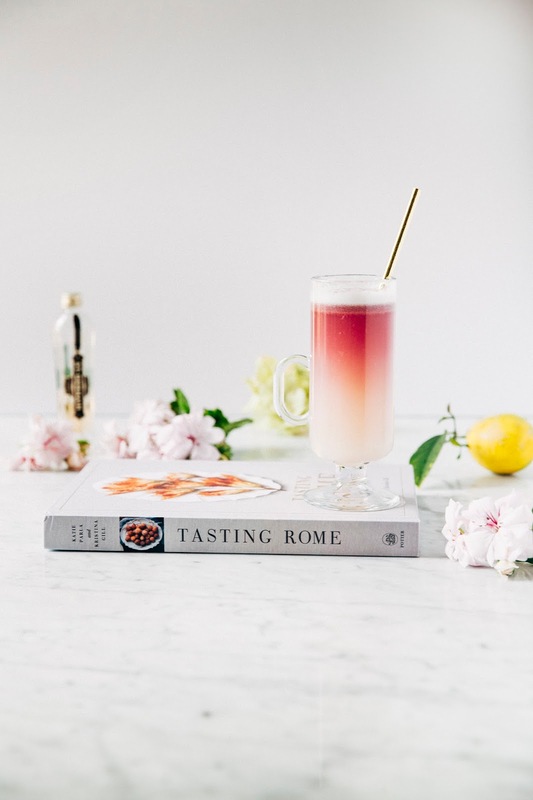 This cocktail recipe comes from Tasting Rome, a new cookbook exploring the cuisine of one of Italy's most famous cities. 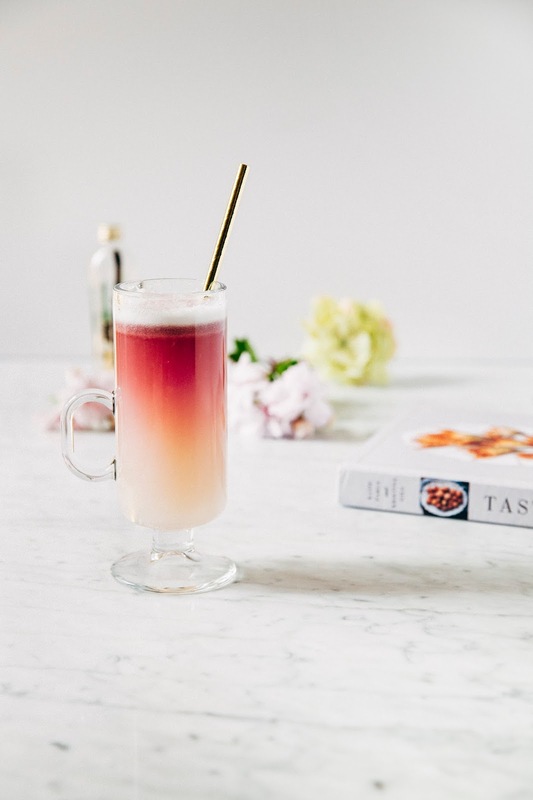 The cookbook is full of delicious recipes for fried risotto balls and thin crust Roman-style pizza, but this particular cocktail recipe caught my eye because of its pretty ombre color. 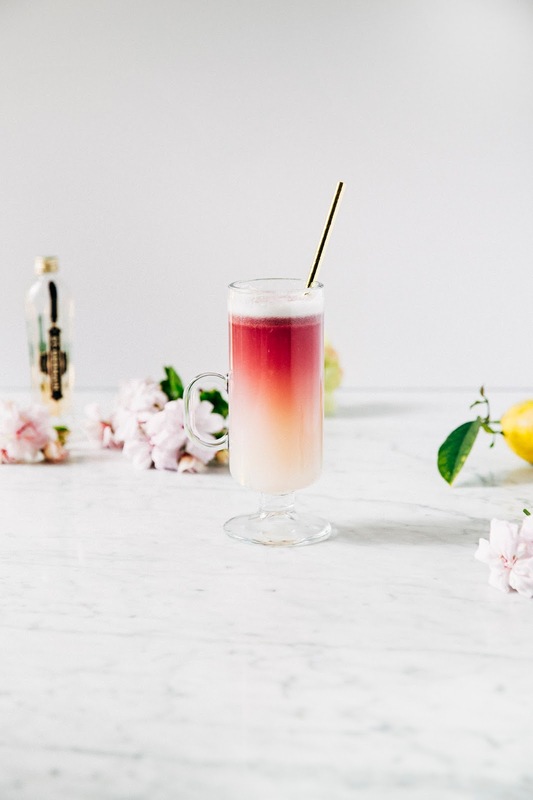 This recipe is the house cocktail recipe from Hotel Adriano's cocktail bar, which at one point, had the largest gin collection in all of Italy. Made with gin, elderflower liqueur, freshly squeezed lemon juice, and simple syrup, it's everything I want in a drink. To celebrate Tasting Rome, I'm teaming up with Clarkson Potter to give away three copies of the book! Each winner will also receive a set of prints from the book, a hand drawn map of the center of Rome, and an extra set of exclusive recipes! To enter, use the widget below and like my (relatively) brand new spankin' Facebook page. The giveaway is open worldwide, and ends on April 18th at 8:00AM PDT. The winners will be chosen at random. The original recipe instructs you to combine the ingredients in a metal cocktail shaker and use a Hawthorne strainer to make the egg white foamy. Uh, I have NONE of those things (because I am lame) and instead used a mason jar with a lid. It worked surprisingly well; the only difference as far as I can tell is that my cocktail isn't as foamy as the one in the cookbook pictures. 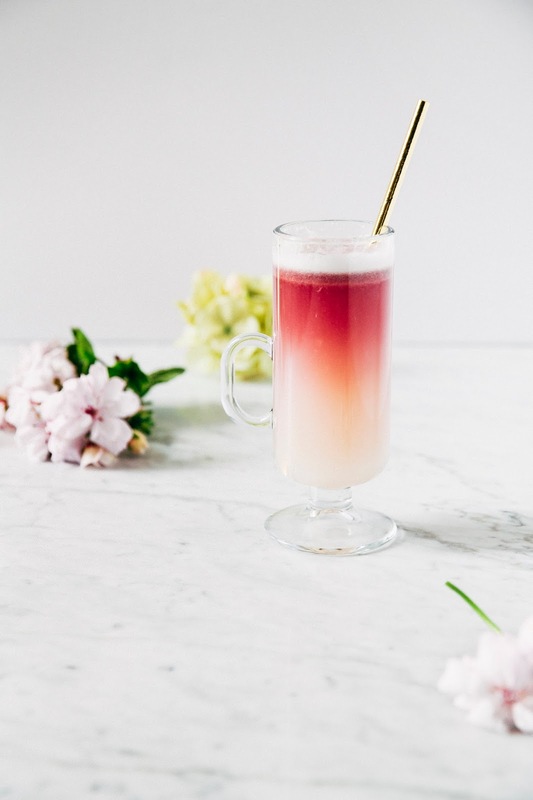 This recipe works best if you use a tall glass to show off that pretty ombre! I used this Irish coffee mug from Crate and Barrel. Speaking of ombre, you get that pretty effect by adding the wine last. 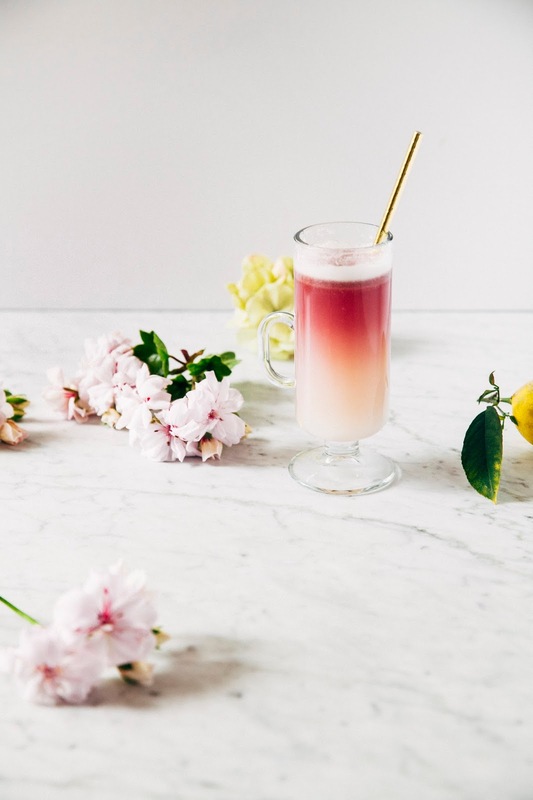 The wine will automatically sink below the foam created by the egg white, but still be lighter than the rest of the drink. Pretty cool huh? The original recipe also instructs you to use a bar spoon as you pour the wine in, but I used a regular one to the same effect. 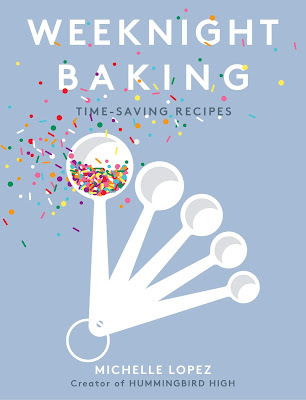 In a small, heavy bottomed saucepan over medium-high heat, combine 1 cup granulated sugar and 1 cup water. Whisk until the sugar dissolves, and bring the mixture to a boil. 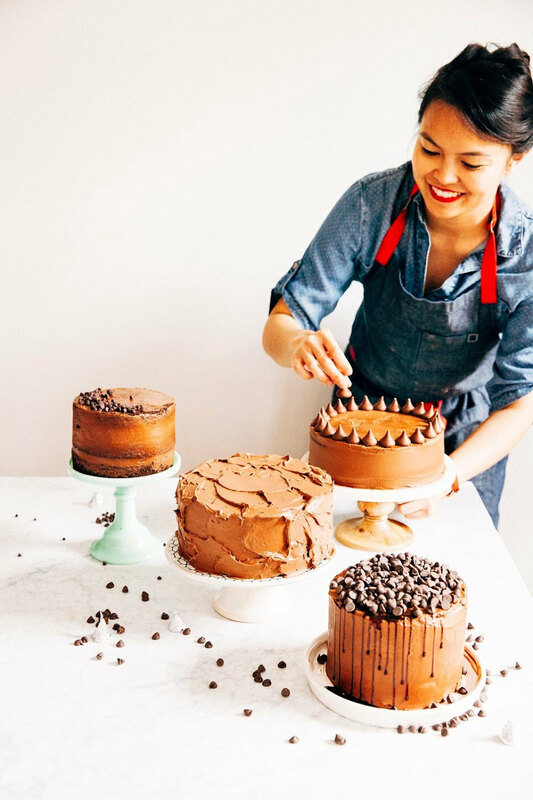 Remove from heat and set aside on a wire rack to cool to room temperature. Transfer to a glass jar with a lid and chill in the refrigerator for up to 1 week.